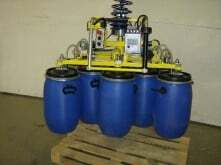 Scaglia INDEVA designs and supplies various customized systems for the handling, rotation and lifting of barrels and drums in an easy, ergonomic and safe way. Versions available for installation include column and ceiling construction as well as rail and rigid arm versions. Barrels and drums are easy to pick and move with the INDEVA® manipulators.